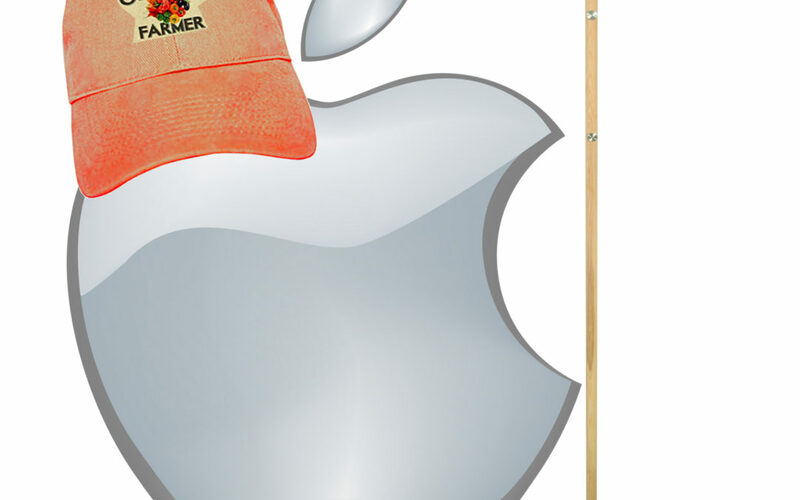 Apple’s Installed Base – Foundation for Success, or Curse? The last few quarters sales growth has not been as good for Apple as it once was. The iPhone X didn’t sell as fast as they hoped, and while the Apple Watch outsells the entire Swiss watch industry it does not generate the volumes of an iPhone. And other new products like Apple Pay and iBeacon just have not taken off. 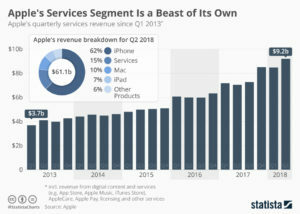 Amidst this slowness, the big winner has been “Apple Services” revenue. This is largely sales of music, videos and apps from iTunes and the App store. In Q2, 2018 revenues reached $9.2B, 15% of total revenues and second only to iPhone sales. Although Apple does not have a majority of smartphone users, the user base it has spends a lot of money on things for Apple devices. A lot of money. In a bit of “get them the razor so they will buy the razor blades” CEO Tim Cook’s Apple is increasingly relying upon farming the “installed base” of users to drive additional revenues. Leveraging the “installed base” of users is now THE primary theme for growing Apple sales. And even old-tech guys like Warren Buffett at Berkshire Hathaway love it, as they gobble up Apple shares. As do many analysts, and investors. Apple has paid out over $100B to developers for its services, and generated over $40B in revenues for itself – and with such a large base willing to buy things developers are likely to keep providing more products and working to grow sales. But the risks here should not be taken lightly. At one time Apple’s Macintosh was the #1 selling PC. But it was “closed” and required users buy their applications from Apple. Microsoft offered its “open architecture” and suddenly lots of new applications were available for PCs, which were also cheaper than Macs. Over a few years that “installed base” strategy backfired for Apple as PC sales exploded and Mac sales shrank until it became a niche product with under 10% market share. Today, Android phones are the #1 smartphone market share platform, and Android devices (like the PC) are much cheaper. Even cheaper are Chinese made products. Although there are problems, the risk exists that someday apps, etc for Android and/or other platforms could become more standard and the larger Android base could “flip” the market. The history of companies relying on an installed base to grow their company has not gone well. Going back 30 years, AM Multigraphics an ABDick sold small printing presses to schools, government agencies and businesses. After the equipment sale these companies made most of their growth on the printing supplies these presses used. But competitors whacked away at those sales, and eventually new technologies displaced the small presses. The installed base shrank, and both companies disappeared. Xerox would literally give companies a copier if they would just pay a “per click” charge for service on the machine, and use Xerox toner. Xerox grew like the proverbial weed. Their service and toner revenue built the company. But then people started using much cheaper copiers they could buy, and supply with cheaper consumables. And desktop publishing solutions caused copier use to decline. So much for Xerox growth – and the company rapidly lost relevance. Now Xerox is on the verge of disappearing into Fuji. HP loved to sell customers cheap ink-jet printer so they bought the ink. But now images are mostly transferred as .jpg, .png or .pdf files and not printed at all. The installed base of HP printers drove growth, until the need for any printing started disappearing. The point? It is very risky to rely on your installed platform base for your growth. Why? Because competitors with cheaper platforms can come along and offer cheaper consumables, making your expensive platform hard to keep forefront in the market. That’s the classic “innovator’s dilemma” – someone comes along with a less-good solution but it’s cheaper and people say “that’s good enough” thus switching to the cheaper platform. This leaves the innovator stuck trying to defend their expensive platform and aftermarket sales as the market switches to ever better, cheaper solutions. It’s great that Apple is milking its installed base. That’s smart. But it is not a viable long-term strategy. That base will, someday, be overtaken by a competitor or a new technology. Like, maybe, smart speakers. They are becoming ubiquitous. Yes, today Siri is the #1 voice assistant. But as Echo and Google speaker sales proliferate, can they do to smartphones what smartphones did to PCs? What if one of these companies cooperates with Microsoft to incorporate Cortana, and link everything on the network into the Windows infrastructure? If these scenarios prevail, Apple could/will be in big trouble. I pointed out in October, 2016 that Apple hit a Growth Stall. When that happens, maintaining 2% growth long-term happens only 7% of the time. I warned investors to be wary of Apple. Why? Because a Growth Stall is an early indicator of an innovation gap developing between the company’s products and emerging products. In this case, it could be a gap between ever enhanced (beyond user needs) mobile devices and really cheap voice activated assistant devices in homes, cars, offices, everywhere. Apple can milk that installed base for a goodly while, but eventually it needs “the next big thing” if it is going to continue being a long-term winner. One in five American homes with wifi now has an Amazon Alexa. And the acceptance rate is growing. To me that seems remarkable. I remember when we feared Google keeping all those searches we did. Then the fears people seemed to have about Facebook knowing our friends, families and what we talked about. Now it appears that people have no fear of “big brother” as they rapidly adopt a technology into their homes which can hear pretty near everything that is said, or that happens. It goes to show that for most people, convenience is still incredibly important. Give us mobile phones and we let land-lines go, because mobile is so convenient – even if more expensive and lower quality. Give us laptops we let go of the traditional office, taking our work everywhere, even at a loss of work-life balance. Give us e-commerce and we start letting retailers keep our credit card information, even if it threatens our credit security. Give us digital documents via Kindle, or a smart device on the web grabbing short articles and pdf files, and we get rid of paper books and magazines. Give us streaming and we let go of physical entertainment platforms, choosing to download movies for one-time use, even though we once thought “owning” our entertainment was important. With each new technology we make the trade-off between convenience and something we formerly thought was important. Such as quality, price, face-to-face communications, shopping in a store, owning a book or our entertainment – and even security and privacy. For all the hubbub that regulators, politicians and the “old guard” throws up about how important these things were, it did not take long for these factors to not matter as convenience outweighed what we used to think we wanted. Now, voice activation is becoming radically important. With Google Assistant and Alexa we no longer have to bother with a keyboard interface (who wants to type?) or even a small keypad – we can just talk to our smart device. There is no doubt that is convenient. Especially when that device learns from what we say (using augmented intelligence) so it increasingly is able to accurately respond to our needs with minimal commands. Yes, this device is invading our homes, our workplaces and our lives – but it is increasingly clear that for the convenience offered we will make that trade-off. And thus what Alexa can do (measured in number of skills) has grown from zero to over 45,000 in just under 3 years. And now, Amazon is going to explode the things Alexa can do for us. 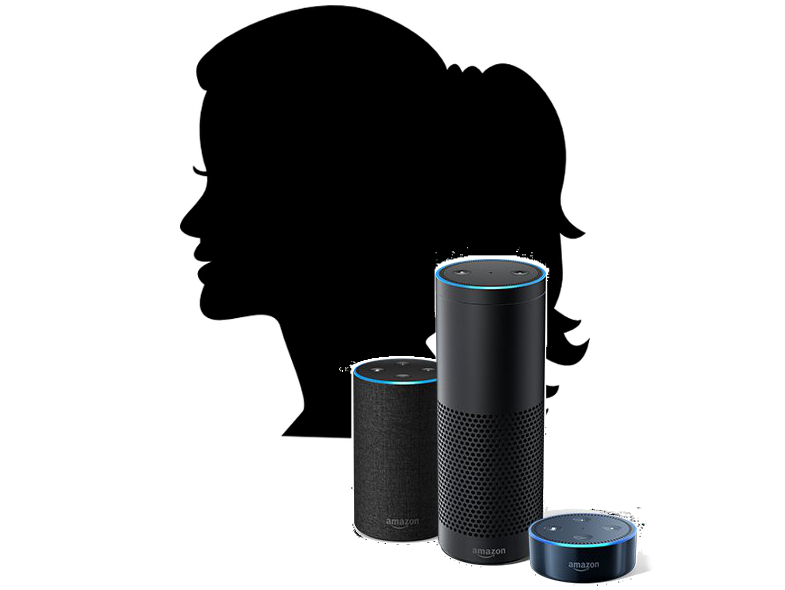 Historically Amazon controlled Alexa’s Skills market, allowing very few companies to make money off Alexa transactions. But going forward Amazon is monetizing Alexa, and developers can keep 70% of the in-skill purchase revenues customers make. Buy a product or service via Alexa and developers can now make a lot of money. And, simultaneously, Amazon is offering a “code-free” skills developer, expanding the group of people who can write skills in just minutes. In other words, Amazon is setting off a gold rush for Alexa skills development, while simultaneously making the products remarkably cheap to own. This is horrible news for Apple. Apple’s revenue stagnated in 2016, declining year over year for 3 consecutive quarters. I warned folks then that this was a Growth Stall, which often implies a gap is developing between the company and the market. While Apple revenues have recovered, we can now see that gap. Apple still relies on iPhone and iPad sales, coupled with the stuff people buy from iTunes, for most of its revenue and growth. But many analysts think smartphone sales may have peaked. And while focusing on that core, Apple has NOT invested heavily in Siri, its voice platform. Today, Siri lags all other voice platforms in quality of recognition, quality of understanding, and number of services. And Apple’s smart speaker sales are a drop in the ocean of Amazon Echo and Echo Dot sales. By all indications the market for a lot of what we use our mobile devices for is shifting to voice interactivity. And Apple is far behind the leader Amazon, and the strong #2 Google. Even Microsoft’s Cortana quality is considered significantly better than Siri. If this market moves as fast as the smartphone market grew it will rob sales of smartphones and iTunes, and Apple could be in a lot of trouble faster than most people think. Relevancy is a currency quickly lost in the competitive personal technology business. 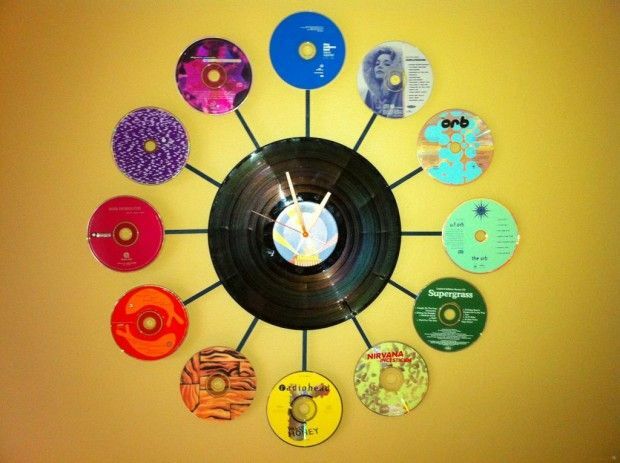 Do you still have a pile of compact discs? If so, why? When was the last time you listened to one? Like almost everyone else, you probably stream your music today. If you are just outdated, you listen to music you bought from iTunes or GooglePlay and store on your mobile device. But it would be considered prehistoric to tell people you carry around CDs for listening in your car – because you surely don’t own a portable CD player. 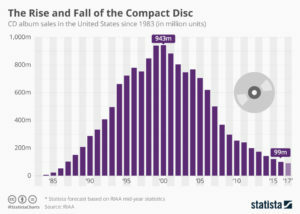 As the chart shows, CD sales exploded from nothing in 1983 to nearly 1B units in 2000. Now sales are less than 1/10th that number, due to the market shift expanded bandwidth allowed. Do you still carry a laptop? If so, you are a dying minority. As PCs became more portable they became indispensable. Nobody left the office, or attended a meeting, without their laptop. That trend exploded until 2011, when PC sales peaked at 365M units. 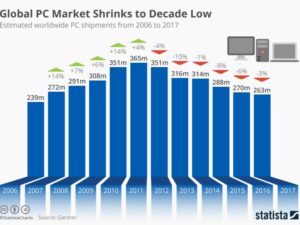 As the chart shows, in the 6 years since, PC sales have dropped by over 100M units, a 30% decline. The advent of mobile devices (smartphones and tablets) coupled with expanded connectivity and growing cloud services allowed mobility to reach entirely new levels – and people stopped carrying their PCs. And just like CDs are disappearing, so will PCs. These charts dramatically show how quickly a new technology, or package of technologies, can change the way we behave. Simultaneously, they change the competitive landscape. Sony dominated the music industry, as a producer and supplier of hardware, when CDs dominated. But, as I wrote in 2012, the shift to more portable music caused Sony to fall into a rapid decline, and the company suffered 6 consecutive years (24 quarters) of falling sales and losses. The one-time giant was crippled by a technology shift they did not adopt. And they weren’t alone, as big box retailers such as Best Buy and Circuit City also faltered when these sales disappeared. Once, Microsoft was synonymous with personal technology. Nobody maximized the value in PC growth more than Microsoft. But changing technology altered the competitive landscape, with Apple, Google, Samsung and Amazon emerging as the leaders. Microsoft, as the almost unnoticed launch of Windows 10 demonstrated, is struggling to maintain relevancy. Too often we discount trends. Like Sony and Microsoft we think historical growth will continue, unabated. We find ways to discount market shifts, saying the products are “niche” and denigrating their quality. We will express our view that the market has “hiccuped” and will return to growth again. By the time we admit the shift is permanent new competitors have overtaken the lead, and we risk becoming totally obsolete. Like Toys-R-Us, Radio Shack, Sears and Motorola. The time for action is when the very first signs of shift happened. I’ve written a lot about “Growth Stalls” and they occur in just 2 quarters. 93% of the time a stalled company never again grows at a mere 2%/year. Look at how fast GE went from the best company in America to the worst. It is incredibly important that leadership react FAST when trends push customers toward new solutions, because it often takes very little time for the trend to make dying markets completely untenable.